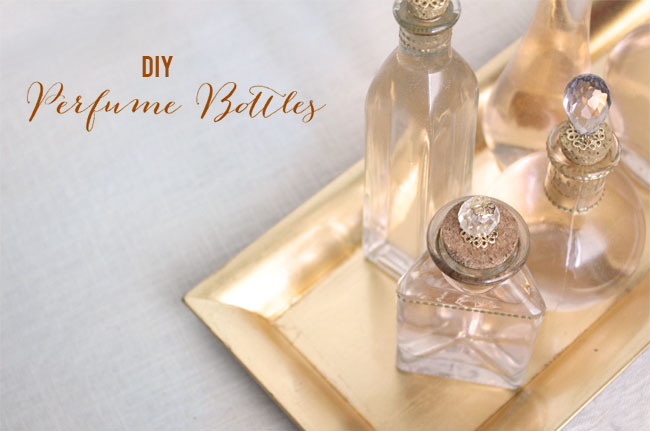 These pretty perfume bottles from our DIY contributor Christy of One Handspun Day only take a few minutes to craft and can be customized in so many different ways. Switch up the beads, add hanging tags with swirling calligraphy, tie a piece of velvet ribbon around them, attach beads to the glass bottle, or embellish in any other way that catches your fancy! 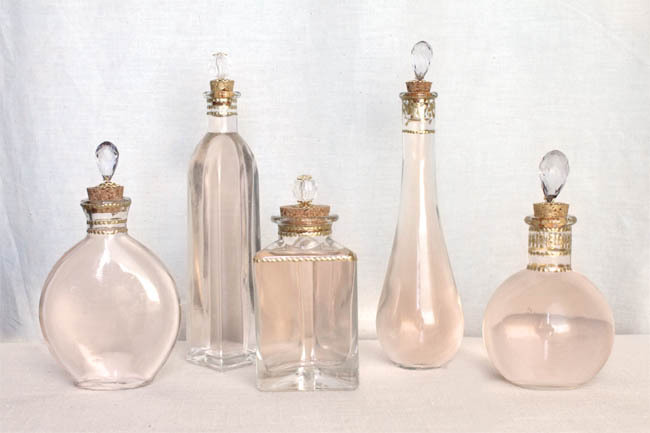 And wouldn’t these be fun to have as part of a DIY perfume bar for your maids to mix up their own fragrance as a thank you gift? 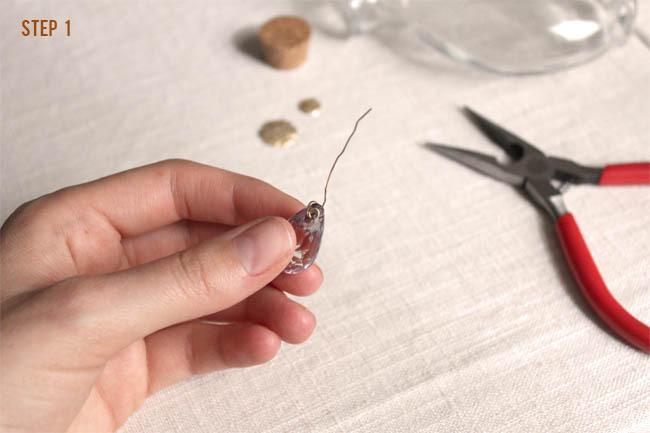 Thread a bead pin through the hole of a teardrop crystal bead and loop it a couple of times, pulling tightly to hold in place. 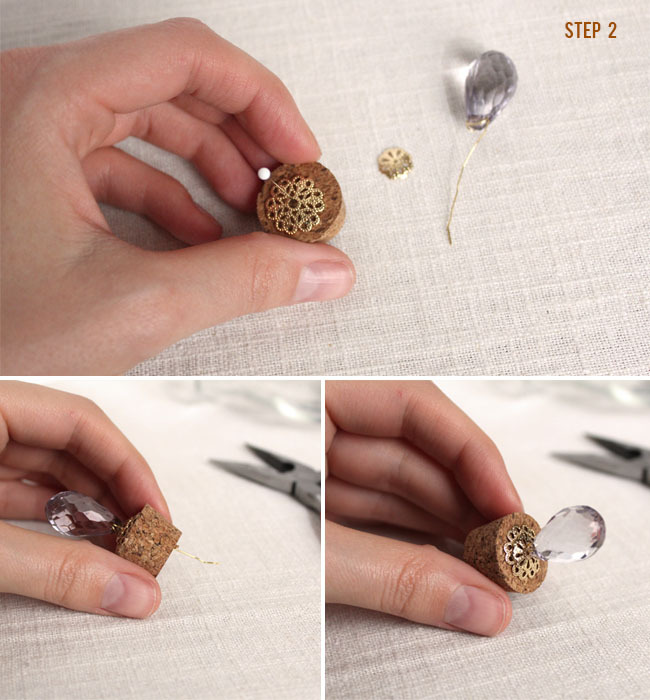 If the bead is round then thread a bead cap onto it before adding the bead. 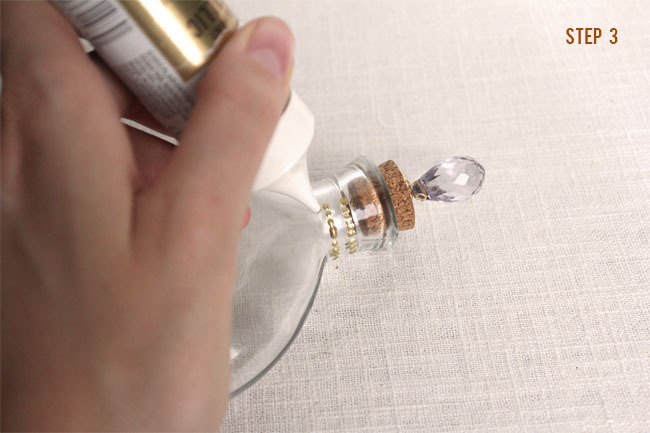 Remove the cork from the glass bottle and position a bead cap on top of the cork. 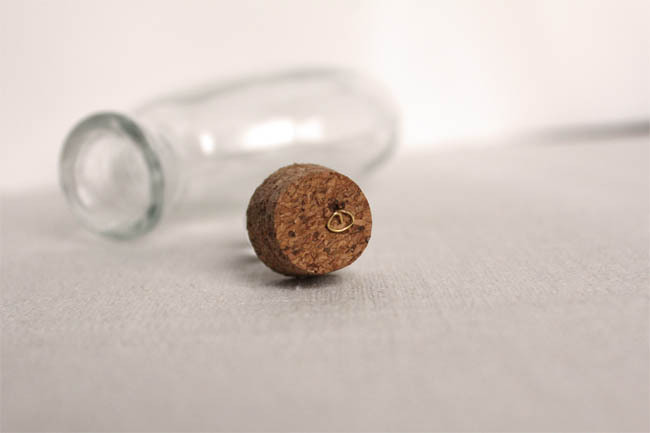 Push a pin all the way through the center to create a hole in the cork. Thread the bead pin through the hole and twist the end tightly to hold the bead topper in place. 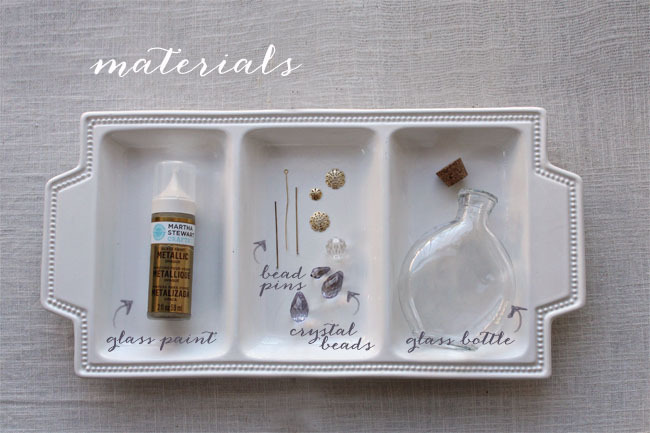 Add embellishments to the bottle using glass paint. You can create any type of design, but I found that lines of dots made a lovely texture and were easy to draw. 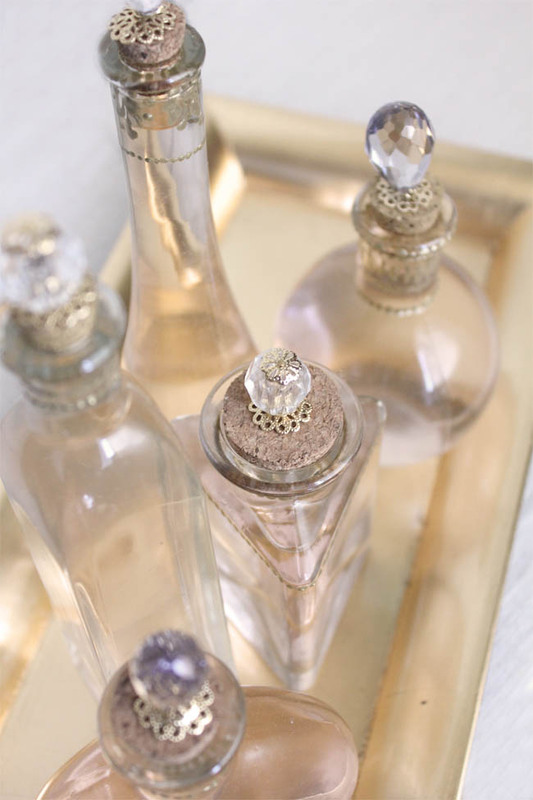 Step Four: Fill with a handmade perfume or any other liquid of your choice – I chose to fill mine with fresh rose water, which I made by following this tutorial from Roost blog. So pretty, right? And easy to make which of course I love! These are so beautiful and so simple! I love the crystal + gold + rose color palette. 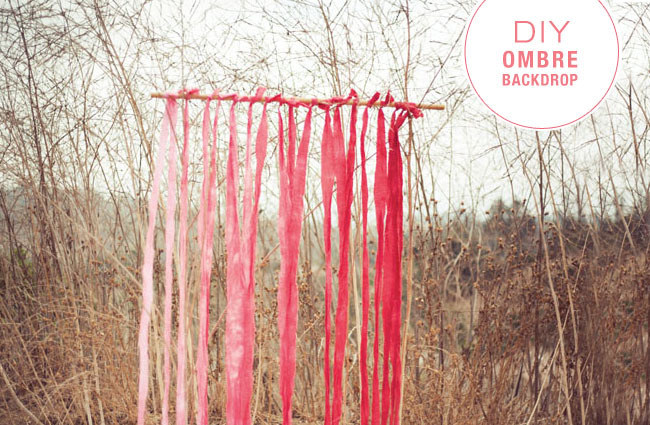 I’ve been holding off making my own rose water but now I have some wonderful inspiration! These are gorgeous. Love Christy’s work! Aww, so sweet. Thanks Nell!